Today the Board of Education will vote on next year's budget directly after a hastily-rescheduled work session which begins at 8 am. Although so much has happened since this time last year, in many ways we are exactly where we were. Do we have any reason to believe that this year's vote will be different? Last night I re-read Board Member Bess Altwerger's statement on the occasion of last year's budget. It's chilling to me that absolutely no progress has been made on any of her points of concern. Take a moment to read it. It's a beautiful combination of respect, courtesy, and dissent. And it floors me that our board as a whole hasn't addressed any of these concerns. Not one. As a community we have worked to make changes for our schools, most notably at the polls and in Annapolis. Parents, teachers, and community members are awakened and engaged and active in the cause of improving our schools. Our County Council is responding to issues of accountability and transparency. This does not change the fact that in December we will have a better board of education, but now, as the budget vote looms, we do not. After deep reflection, I have decided to vote against the budget in accordance with my own conscience and best judgement, and in response to the public comments and testimonies coming from educators, parents and community members who believe that this budget does not reflect the priorities that have kept our schools among the best in the state and the nation. I agree with many of their concerns. Priorities. That's it in a nutshell. If the Superintendent and the Board use the budget impasse as a tool to violate negotiated agreements with teachers, then their priorities will be quite clear. A budget should not be used as a weapon against those who are unable to fight back. If it is used in this way it will wound not only teachers and staff, but our children. Keep your eyes open, Howard County. There's six months until December and it looks like it's going to be a bumpy ride. *That last one may bear revisiting. Pay close attention to how the budget circus plays out. Jason Whong works for The Maryland Daily Record. He also lives in Columbia. 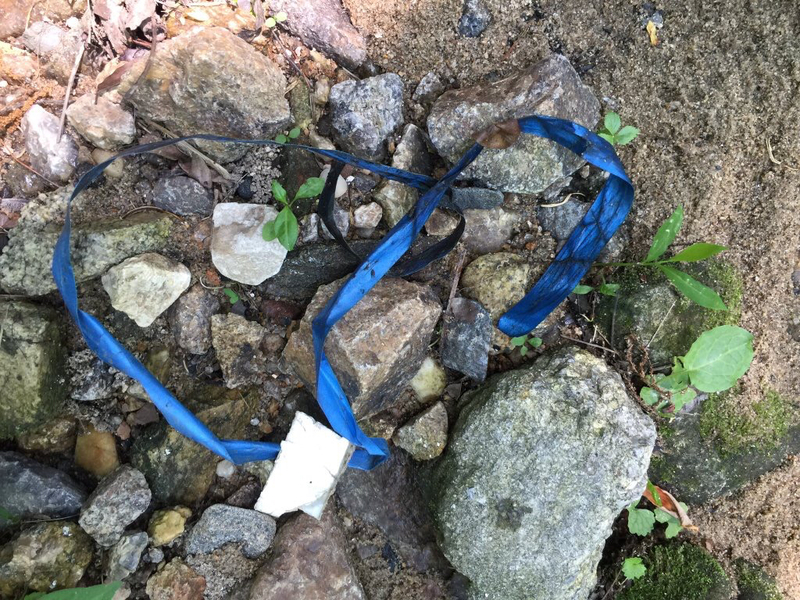 While I follow him on Twitter because of his news connection, a recent theme has emerged in his Twitter stream that bears sharing with my readers. These days I read a lot of complaints about what's wrong with Columbia which center around making demands and railing against the evils of change. Demand that the noise at Merriweather stop. Demand that commercial development stop. Demand that no trees are ever to be cut down. Demand that CA's Open Space be controlled by Pioneers. Well I have a demand, too. No, a suggestion. I'm just not the demanding type. Stop littering. 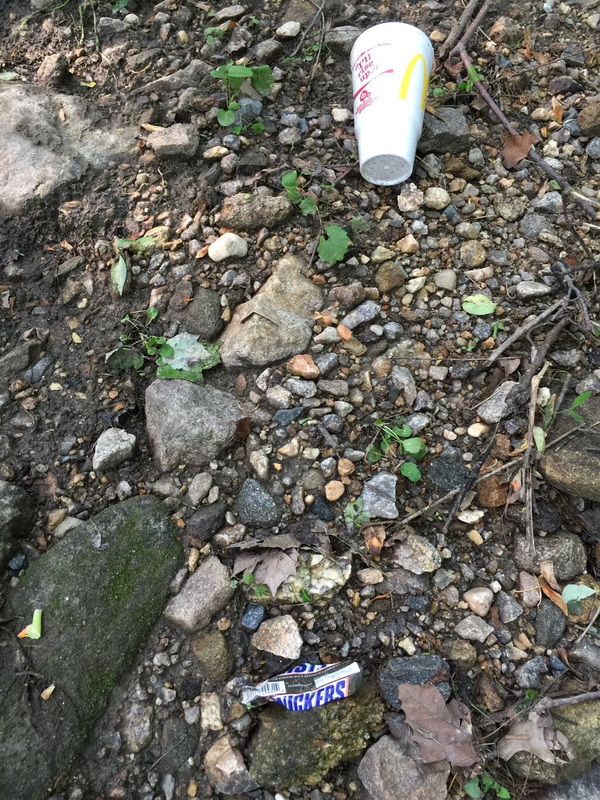 Teach your children and grandchildren not to litter. And while you are at it, do what Jason Whong does. 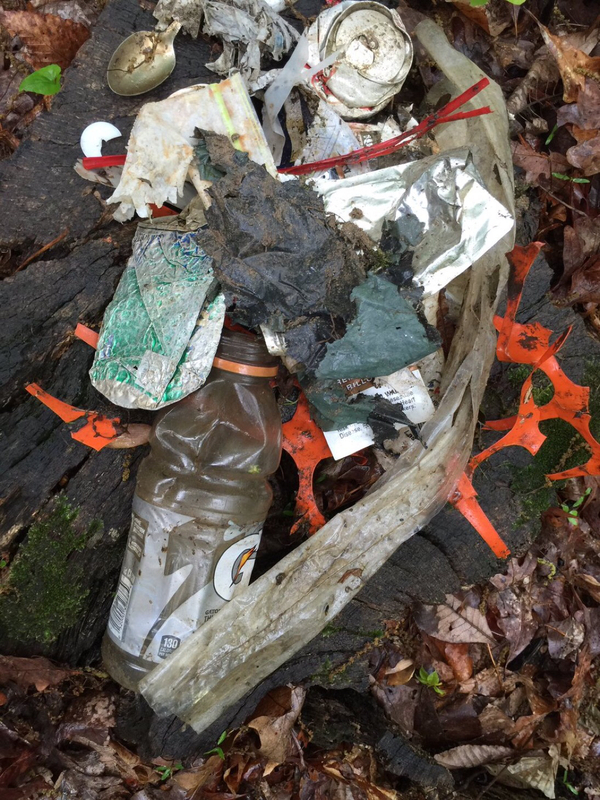 Walk the pathways with a trash bag and pick up trash. It's a little thing that we can do to make Columbia and better place that doesn't involve angry demands, contentious public meetings, or biting letters to the editor. All of the Columbia Villages organize cleanups every year, and that is wonderful. I have participated in one, and it was surprisingly fun to do dirty work with a bunch of friends and neighbors. But don't wait for an annual event. Just jump in where you are. We really can make a difference, one person at a time. 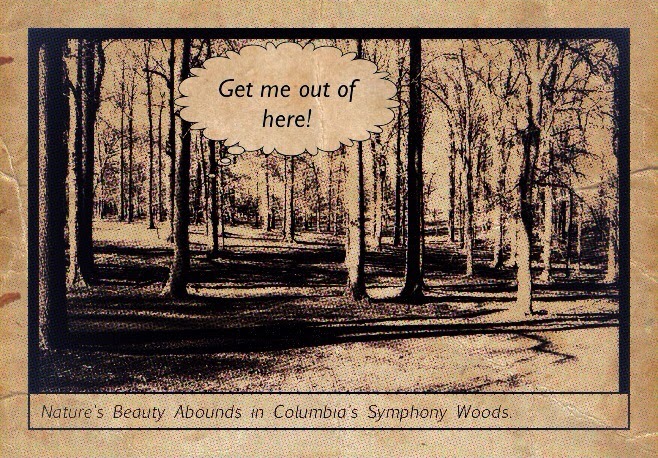 "A City Where Man and Nature Co-exist", a reporter called Columbia in 1982. But to coexist we must contribute, to accept responsibility for being a positive partner rather than a force for destruction. Like Jason, we all have personal reasons for protecting and preserving the natural environment of our home. Quadroplexes. It's a word I had never heard until I moved to Columbia. I live in a community of homes which are four houses stuck together, dotted across the rolling suburban terrain in that peculiar Columbia way. I've heard that Rouse wanted the natural topography of the land to be left untouched as much as possible. For us this means some great sledding hills and some terrible runoff issues every time it rains. Each little house has its own fenced-in patio. Some have small yards, some none at all more than a tiny flower bed out front. It just depends on how the building is situated. The grassy areas all around are common area. I'd love to see them used more and enjoyed more, but usually they're just green, well-mowed, and empty. The house at the top of the hill, on the corner, is a bit different from the rest. Long ago an owner removed the fencing around the patio so their back yard opens up into the common space. Something about that layout has made that particular home the best one in the neighborhood for outdoor entertaining. When my daughter was little she dubbed it "the party house." It has never been a problem. It's just something interesting about my quirky little neighborhood. Well, maybe it was a problem to my daughter, who wondered why we could see people having cook-outs and having fun but we never got to join them, Because, while we know all the people in our immediate vicinity, we don't know anyone "at the top of the hill." You'd think it was in a different time zone or something. Silly, when you think about it. But our paths never cross. Maybe they park in the other parking lot on the other side of the neighborhood. Well, last night, when we got home from visiting a friend, the Party House was kicking it up a notch with the biggest outdoor party this neighborhood has seen in the last 15 years, complete with amplified music. It was loud. It was loud enough that we could still hear it when we went inside the house, but not painfully so. We have decent windows that muffle a lot of outdoor sound, plus the intermittent blowing of the AC provided a filter. It was a little annoying. But it wrapped up at a decent hour and didn't interfere with anyone here getting to sleep. It was one loud party in a neighborhood that doesn't have enough parties. I'd love to get a bunch of acoustic guitars out on the grassy areas outside our house for a jam session, or see a neighborhood-wide water balloon battle for kids out back. This morning I could be complaining, and most people would think I was completely justified. But I'm not. It was the first big cookout of summer. Maybe it was a graduation party. Who knows? It was a temporary inconvenience for us but it also was a sign of life. People live here, celebrate here. That's a good thing. I work in an afterschool program in an independent school. Each day follows a general overall pattern: snack, time for indoor play/reading/homework, some sort of activity for the day, outdoor play. We've done everything from building and decorating a cardboard city, going on nature hikes, having a scavenger hunt, planting seeds and caring for them, making gak, making homemade ranch dip for trying lots of raw vegetables for snack...you get the picture. Probably the best part of this program to me is how different it feels from the standardized approach of most childcare and school programs. It is the closest thing one's child could have to playing in a home neighborhood with neighborhood kids and plenty of supportive adults on tap to support their play and keep things safe. Many of us had this experience as children but have seen it disappear from modern life. Wednesday's activity was making popsicles. The kids prepped and sliced strawberries, squeezed oranges for juice, mixed with simple syrup and blended the mixture in the blender. (I should note the the students are divided into three groups by age, so each group did these tasks in a way that was appropriate to their abilities.) When it was ready, we poured it into paper cups, added popsicle sticks, and put them in the freezer. The next day, Thursday, was hot. The kids came to aftercare excited about enjoying their homemade snack. But when the afternoon began there was an added treat--the lower school instrumental ensemble was preparing for a concert and was going to do a performance for us--outside. 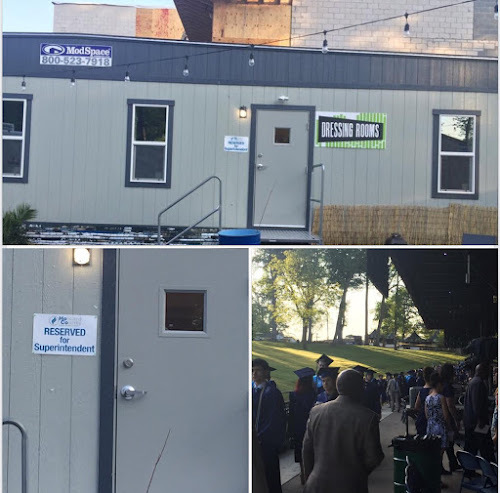 The music room is in a "relocatable" trailer sort-of-thing, with the added bonus of a screened-in porch facing the playground. The instrumentalists were set up there, ready to play. This is how it went down: older kids helped set up chairs and benches for the audience, and a big blanket was laid out on the grass for younger kids. Then we all had our popsicles while listening to familiar early level tunes such as Hot Cross Buns, Twinkle, Twinkle Little Star, and Skip to My Lou. The music teacher invited kids to get up and skip to that last one, and, by golly, they did. A flute student played the Star Wars theme as a solo. That was a huge hit with the audience. We sat in the shade, eating homemade popsicles and listening to music. The frozen treats weren't perfect--we hadn't strained out the strawberry seeds. The music wasn't perfect--it was a beginning ensemble, after all. The seating wasn't perfect--the sun started beating down on the blanket so we got everyone up and moved it into a shadier spot. What made this such a brilliant event was not perfection. It was (and I cringe to use this word which has been co-opted by the ed reform industry) authentic. It was real life, in the way that childhood should be. On a hot day we had a cool treat that we helped to make ourselves, listened to our friends make music while we sat in the shade, and then we got up and played on the playground. 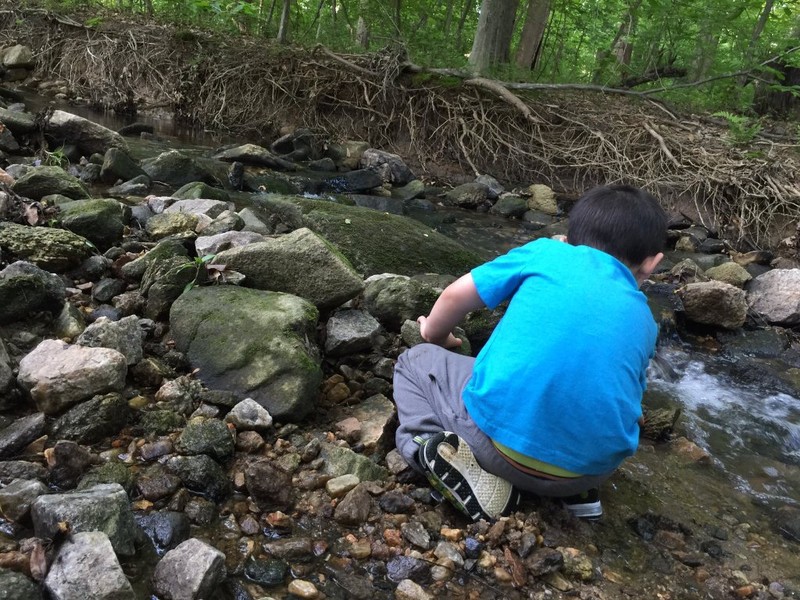 Each child comes to us needing the real nourishment that comes from real experiences to explore, create, play, share, question, discover. These are the kind of life experiences that help to make us fully human. I could analyze every single component of this to show how valuable it is but--you get it, don't you? The long term investment we make in our children should not be in data collection, strengths finder quizzes, standardized testing and compliance with The System. All of these are false gods. If our only goal is "college and career ready", we are falling so pitifully short of the mark. We all need to be "living and loving ready", most of all. If we don't make that a priority, we are denying our children the most basic tools for life. It can begin as simply as a homemade popsicle. I'd like to turn it into a movement. Join me. I spent most of the day yesterday out of the house and away from social media. By the time I got home at seven, I had missed all the excitement of the County Council meeting. Thank goodness I had two articles in the Howard County Times plus eyewitness accounts on social media to bring me up to speed. [County Council Chair] Ball's proposed [budget oversight] committee will help the Council analyze the Board of Education's budget and provide recommendations in preparation for next year's fiscal year 2018 budget, Ball said. The audit, by the county's auditor, may include analysis of items that have been frequently questioned in public sessions during the current budget season, including special education, the school system's health and dental fund and legal services. The County Council has spent a huge amount of time on this. In this decision we see the culmination of studying two different budgets, hearing from the school system and community members, working collaboratively with the County Executive and with eachother to respond to a difficult challenge. I think they have navigated this treacherous terrain astoundingly well. Yesterday was a victory for community input, for financial prudence, and for transparency in our school system. But it wasn't the end of this matter by any stretch of the imagination. Tuesday morning, at 8 am (remember that?) the Board of Education will respond as they hold their annual meeting to vote on their budget. I would like to believe that the message that the County Executive and the County Council are sending here will be received. Experience suggests that it will not. How will Central Office (instruct the Board to) respond? Tune in Tuesday morning to find out. The more eyes on this, the better. Nice job, County Council. Enjoy your holiday weekend. You've certainly earned it. Why? Some people mentioned possible costs, in light of the current budget crisis, but overall the reaction was not to money but to message: how does this look? What does it say to the community? On a day which should be about young people graduating and beginning new lives we are dumbstruck by another moment of institutional disconnect. That's a good message for everyone, not just for graduates. The title of his piece, "Yesterday Was About You, Tomorrow Is About Us" feels particularly apropos. When the new journey begins, it's a journey we take together. I hear that by later in the day the specially-printed sign had been removed from the Superintendent's private trailer. Someone must have gotten the message that when it comes to commencement, it's not about you, it's about us. This Thursday. 7:30 PM. Board of Education Budget Adoption. Teachers will be present wearing red, parents in support will be wearing blue to support the adoption of a fair and equitable budget. That meeting was canceled yesterday. It's been rescheduled for 8 am Tuesday. If you're a teacher? Can't go. If you're a parent? You're either getting a child off to school or on your way to work. Can't go. Aw...too bad. I'll bet there are plenty of employees at Central Office to fill those seats. Transparency. Accountability. Responsiveness. Collaboration with stakeholders. When I learned of this last-minute switch yesterday I was, as my mother would have said, "fit to be tied." So I thought. And I thought. Who might be available at 8 am on a Tuesday morning the day after the Memorial Day? The BOE final budget approval meeting scheduled for Thursday has been rescheduled for Tuesday at 8am. Reportedly with the County Council vote Thursday morning they would not have sufficient time to obtain any input from the superintendent/staff about what cuts to make. A meeting time of 8 am clearly excludes attendance at this event by teachers, staff, and most parents. It seems a rather odd way to hold a public meeting. I am inviting you to attend in our place. Your constituents, the stakeholders of the Howard County Schools, are again shut out by a system supported by our own tax dollars. Therefore we must turn to our elected officials to do for us what we cannot. Please let me know if you will be able to attend Tuesday's meeting. I apologise for the late notice but I only just found out myself. Thank you so much for your service to our community. Do I think they will be able to change their plans at the last minute to attend a hastily-scheduled 8 am meeting? Well--can you? Is that an easy thing for any of us to do? Even though their attendance is unlikely, I still think they ought to know how their constituents are being treated. So I am inviting them both as a request for assistance and as a way of keeping them "in the loop", so to speak, as to how community members are experiencing this year's budget process. I've heard assertions that time is tight at the end of the year, what with graduation season upon us, making it difficult to reschedule this meeting. That may be true. I can't help but wonder why the school system didn't take the time needed to propose a financially responsible budget in the first place. I'm sure a lot of people are wondering that today. *No, I'm not going to report back on who does or doesn't respond. I feel bad enough having to bother them at all about this. Magic. Right now it feels as though we need some. So when I saw this on Twitter I jumped on it. If you need a lift, take a moment to click on the link and enjoy. There's a story, several photo galleries, and a short video. And if nostalgia alone isn't enough to lure you in, there are goats. Baby goats. Lots of them. The Clarks of Clark's Elioak Farm invested time, money, and labor over a period of years to make this recreation of the Enchanted Forest go from a wish to a dream come true. As I look out the window and see rare blue sky and sun I almost wish that I could call in sick to work and just go hang out with storybook scenes and adorable animals. I think it might be soul-restoring. Why am I feeling so in need of recharging and renewal? Well, its going to take time, money, and hard work to restore our school system to one we can trust and be proud of. The closer you are to what is going on right now the more you know how true that is. Just as the Clarks couldn't wave a magic wand to make their dream come true, neither can we. I'm sure they faced challenges and rough days. So do we. It seems as though every day brings a disturbing revelation or an infuriating decision that moves us backwards, away from our goal. It's disheartening, even to the most determined. 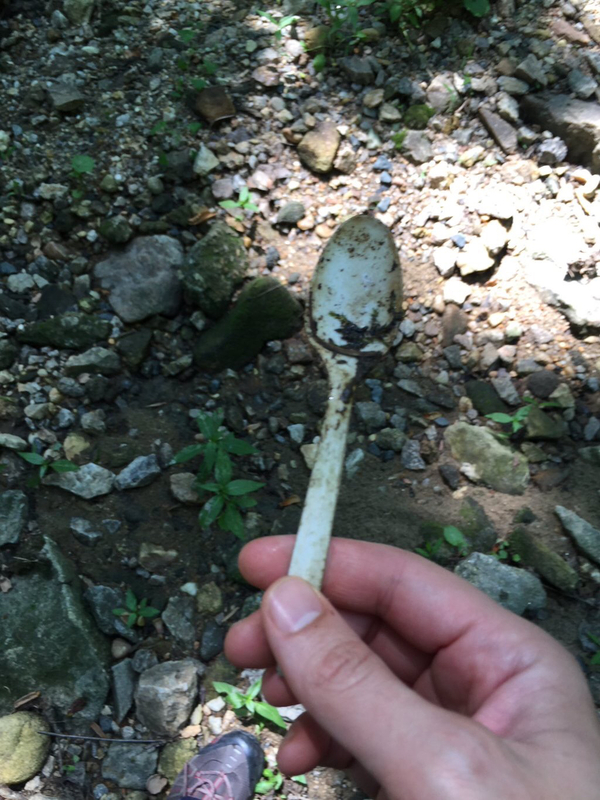 So when I got a chance to look at some real-life magic in Howard County, I jumped at the chance. It can be done, this says to me. We can work together to make it so. But maybe we need some baby goats, just in case. 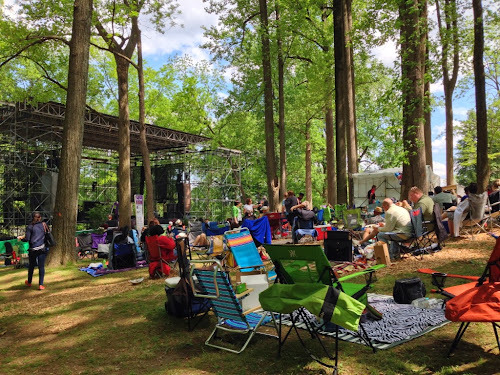 This year's Wine in the Woods was a little bit less Brigadoon and a little more Okefenokee Swamp. I felt a little sad as I made my way downtown to volunteer at the Inner Arbor Trust booth. In my imagination I saw a sparsely attended event, with locals scared off by the dismal weather. I wasn't sure there'd be anyone there at all to stop by and chat about Merriweather Park in Symphony Woods. You cannot stop these people from their annual Spring Rite. They were there with their camp chairs, listening to music. They strolled on muddy paths in rain ponchos, munching on turkey legs. They waited in line for a taste of wine and again for funnel cake. It was pretty amazing. People stepped into our tent, out of the drizzle, to look at drawings of the park. Some had heard of it. Some hadn't. Everyone knew about Merriweather, many knew about the renovations there. Once we started talking, they always had good questions. "What will the pathways be made of?" "Will bikes be permitted on the paths?" "What different ways will the Chrysalis be used?" "Can you tell me more about the giant floating picnic table?" They lived in Long Reach, they said, and liked it. Before that they had lived in Oakland Mills and really liked that, too. "I've really gotten a kick out of everything I've learned about the park so far." Perhaps people who are willing to come out in the rain are the sort of people who are predisposed to have a good time. Add to that the people who are willing to stick their heads into a tent with drawings and plans of a park in progress as being, at the very least, open-minded. There was definitely no Whine in the Woods where we were. Every year more people learn about the park. It may be a long, slow process of evangelism, but it's genuine. And it's taking root. One feature of the new park that came up several times during the afternoon: pervious pathways. A rainy day schlogging through the mud really puts the need for that at the forefront of one's mind. Inner Arbor Trust President and CEO Michael McCall talked about how much impact the weekend's visitors would have, tromping over the grounds in the rain. It's clear that "pervious pathways" aren't just a trendy environmental buzzword, but will have a significant positive impact on the natural environment in the park. As I walked back to my car, I saw three women walking along, talking companionably. They each rolled along their WITW essentials: camp chair, picnic cooler, tote bag. At one driveway they stopped, and I heard them exchange goodbyes. "Thank you so much. And thanks for including me in your birthday celebration. It was wonderful." If that isn't #awesomeColumbia, I don't know what is. Not only can we come out in the rain for Wine in the Woods, but we can make it a party, too. Today is a very special day for the Unitarian Universalist Congregation of Columbia. (UUCC) They are dedicating their new worship space, and celebrating the transformation of their entire building. There is a special service at ten am, and a concert at five pm. The seeds for this transformation began in the gathering of "desirements" in 2010. Six years, a lot of work, and a dedicated capital campaign have made this day possible. In a time when many churches were dealing with the challenges of declining membership and attendance, UUCC was growing. And they wanted to stay right where they were, in an area which has been derisively called "Inner City Columbia." That didn't faze the UU's, whose tradition has pretty much been that of blooming where they are planted. By all the measures of church life--two well-attended weekly services, active Sunday school and youth programs, charitable outreach, a variety of activities and events throughout the year--UUCC is lively and strong. I once joked with a priest that a church's membership would never grown any larger than the room used for coffee hour. The one at OBIC is large but the UU's easily fill it and could use more room. That's a pretty amazing thing. Last Sunday, after the service, people in attendance were invited to write blessings, inspirational thoughts, and prayers on the unfinished wall behind the podium/stage area. I thought about my parents, life-long Unitarians. I had done a little research before coming to the service. Why did my family go to the Unitarian Society downtown, but my grandparents went to the First Unitarian Church in the wealthy suburbs? I never really understood this while I was growing up. 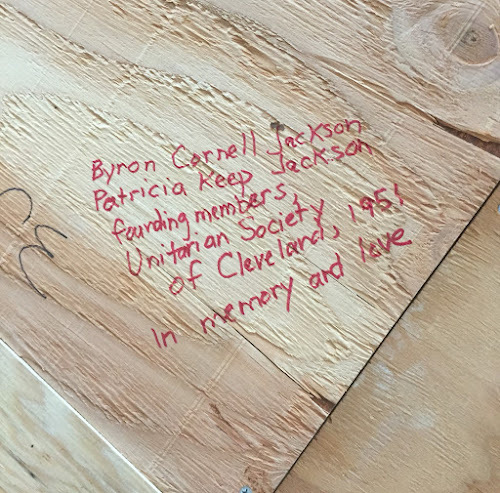 The Unitarian Society of Cleveland was organized to keep a Unitarian presence in the inner city when First Church moved to Shaker Heights in 1951. There it was. My parents had decided to keep blooming where they were planted. My grandparents had not. The old neighborhood didn't feel like their neighborhood anymore, and they left. My parents joined with other likeminded members to create a new church. Sending best wishes to the Rev'd Paige Getty and members of UUCC for a joyful day and a continued vibrant presence in our community. The HCPSS budget survey was unethical, inaccurate, and manipulative. HCPSS sent out a press-release style announcement which was big on spin, short on facts, and hailed the public response as "unprecedented." Give me a break. More people engaged in The People's Voice petition asking that the Board not renew the Superintendent's Contract. In short, the warning "don't take the survey, it's a trap" was completely justified. Who believes all this stuff? Central Office, perhaps, and members of the public who don't follow the school system and think it's safe to believe what they send out. They should be able to. We all should we able to. Sadly, that's not the case. No amendments have been prefiled from the #hocomd council to change school budget thus far. Deadline was 2 pm. There are approximately 57,000 students in the system. Assuming 1.5 parents per household, and the total number of parents who responded, this represents less than 1% of the population. The survey was flawed, HCPSS knows it, yet they are still flouting these numbers as if they have made some kind of major accomplishment. Want a better statistic? Of approximately 255,000 votes for the board of education spots in the primary election, 75% voted for anyone other than the three incumbents who were up for reelection. This is not a stupid population HCPSS is serving. This is not a stupid population HCPSS is serving. Keep up the good work, Howard County people. Keep supporting our students, our teachers, and Howard County Government as they negotiate this complicated and treacherous issue on our behalf. Let the PR machine spin its wheels. We know better. French again, "we have to say these things now for individuals to understand. People blogging out there looking for any way to criticize us." Good grief. There's a completely manufactured budget crisis out on Route 108. HCPSS leadership is attempting to blame it all on the County Executive, but wait. Let's take a moment to take a potshot at local bloggers. I must admit I felt an immediate and rather odd kinship with Alan Kittleman. The so-called "selfish" music parents who fought reduction in music and art instruction. "Greedy" teachers who wanted a fair contract and adequate compensation. PTACHC leadership when they allowed equal time at meetings to the HCEA representative. Parents and teachers who asked for transparency and accountability when mold in their schools was making people sick. Parent Barb Krupiarz who sought the release of the complete Special Education Audit. Students who demanded we look at an ugly racist video instead of looking away. The African American Community Round Table membership when their voice became too strong and independent. Although I don't always agree with Sandra French, I have found her to be a gentle, mild-mannered voice on the Board. The fact that she felt compelled to say what she did last night says to me that bloggers and blogs are a matter of concern to school system leadership. It almost makes you wonder if they have an Enemies List. Tom Coale (another of those pesky bloggers) wrote a piece in February on HoCoRising entitled "Public Criticism and Decision-Making." What is interesting, and concerning, is what public critique can do to an organization or government body. It can result in the construction and reinforcement of walls. The members trust no one but themselves. They "read their own press releases" and discount outside commentary as either uninformed or motivated by some out-of-proportion conspiracy to take them out. The members justify withholding information and orchestrate farcical expressions of public support. They engage in more closed meetings, faster decision-making, and less explanation for the same. Why? Because they know best. The hardest thing to accept is that they actually have good intentions. They believe the are on the right side of the issue, but they don't consider how they could ever find out if they weren't. "If everyone who disagrees with us is a bad guy, then anything we say must be good." There it is: everyone who disagrees with them is a bad guy. This may be a bigger crisis than the budget, because it influences everything they do. The work of our school system should be open, inclusive, welcoming. It has been reduced to controlling, manipulating, and punishing. Yes, I was indignant last night, but not out of a sense that I had been unfairly criticized. My anger comes from what this comment reveals: that the voices of parents, teachers, students, and community members are not being heard. They are drowned out by accusations of blame. We see no sign that leadership will look to themselves for responsibility for their own actions. They fiercely persist in trying to make it somebody else's fault. This would be a great day for a lighthearted post bursting with local color. Something quirky and fun. A bit of human interest. Historical anecdotes or perhaps a walk through one of Columbia's villages with an eye to something unexpected. A County Council bogged down in the weeds of the hcpss budget, stuck in a position they never should have been in. A special education teacher describing the horrifying effects that cuts to in-classroom staff are having on students and teachers. We're still finding mold in our schools. CA had to cancel Dog Day Afternoon because of all the rain we've been having. Here are a few crumbs of happiness that are keeping me going this morning: my neighbors' 'adopted' toad "Flower" has returned for a second season, our azalea is in bloom and it's gorgeous, our neighbors' new baby is adorable, my daughter has her first solo with Leading Ladies in their Hawkapella Concert tonight, the Farmers Market in Oakland Mills is off to a great start, and I saw a neighbor on the way home yesterday, which resulted in a goofy grin face-off at the stoplight. Update: a dear friend received the news this morning that she is now cancer-free. What a wonderful day it is, after all. I attended the PATH IAF/HCEA meeting last night at UUCC. It was my first full-scale PATH event, and it gave me a glimpse at why this community organizing group has been so successful. I'm going to have more to say about the theme of the evening later in the week. It's going to take some time to process all the information and do it justice. Today I want to talk about one of last night's speakers. I know her on Twitter as @llurking . I started following her in the aftermath of the turmoil caused by the racist video posted by a Mount Hebron student. While the administration was instructing all of us to look away, Lina was challenging us to look at it and own that this ugliness was also a part of the Howard County experience. Lina and her friend Sara (@saracherni ) worked together to mobilize students and the community to support a student-led walkout. They created the hashtags #stopthesilencestartaconversation and #hocostudentwalkout and used them on Twitter to spread their message. They participated in WAMU's Kojo Nnamdi Show in a discussion on protesting racism at school. Last week Lina and I were flown into San Francisco to speak on a panel series called "Creators for change" hosted by Twitter. We shared our story as the organizers of the Hoco Student walkout and how we used Twitter, periscope and the hashtag as a platform to bring the community together to stand against racism and discrimination in Howard county schools. The panel was broadcasted to all 34 Twitter HQ around the globe and we were featured on twitter's teatime special. 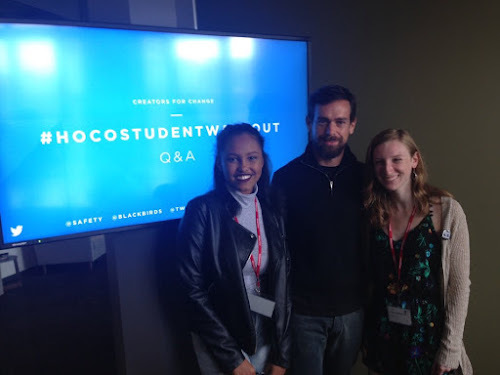 Along with this amazing opportunity, we had a 30 minute meeting with Jack Dorsey (CEO of Twitter) !!! We shared our story and heard his input on the power of the hashtag and how he built up the company. We are the first young people to be invited to their HQ to speak! The entire event felt surreal and I'm so grateful we had the opportunity to share our story with a widespread and progressive audience!! If you don't have a Twitter, do yourself a favor and make an account...it might change the way you see and interact with the world. Lina spoke at the PATH meeting last night about racism in our schools and what we need to do to address it. She challenged us to commit to making Howard County a better place for our children and youth. Her words were thoughtful and powerful, her presentation confident. I am so grateful to her, to Sara, and all the students who refused to be silent and chose, as their response to a shameful act, to start a conversation. These two students truly embody the kind of excellence that HCPSS should be celebrating. Thank you for talking with us about #hocostudentwalkout and the power of the hashtag. 140 meetings with 1400 students, educators and parents later, we have an agenda for the schools we all deserve. Do you want less testing and more staff to work help students learn? Do you believe the role of special education staff and the services that students receive should improve? Do you want schools free of racial discrimination against students? Do you want kids to have access to better food and after school activities? If you said yes, we'll see you 7 pm, at Owen Brown Interfaith Center. This post, on the HCEA Facebook page, is your invitation to participate in a one-of-a-kind experience to shape the education of our children in Howard County. Tonight's meeting is the culmination of months of listening to students, parents, and community members. Now the results will be shared and participants will help to choose an agenda for positive change. PATH (People Acting Together in Howard) and HCEA (Howard County Educator's Association) have kicked off a Community Listening Campaign to engage young people, parents, community members, and educators in a conversation centered around what kind of challenges our schools are facing and what kind of schools our community deserves. I participated in this process as a school parent. PATH and HCEA facilitators asked some very basic questions and then their only job was to keep the conversation going in a positive, respectful way and to write down what people said. It was extremely well run, and took only about an hour. Not only did I have a chance to have my say, but I learned a lot from others who participated. In the aftermath of Thursday's Board of Education meeting, I have seen some comments and write-ups that suggest the theme of those attending was protecting teacher salaries. That's an easy analysis, but not a correct one. If you look at who spoke, and what they said, a deeper message emerges. The signs may say "Stand With Educators" but both the turnout and the testimony say "We Stand With Educators". Current and former students stand with educators. Community members stand with educators. The message of Thursday's meeting was clear: we stand together. Come on out tonight and be a part of the solution: improvement, change, shared goals. If you want something done right, they say, do it yourself. I've been waiting for someone, anyone, to fact check the Howard County Times article about the Board of Education meeting Thursday night. I've read the comments. I've looked for a correction to the article itself. Nothing. "Optimistically, we will have to make decisions that honor the contracts. We've never suggested we weren't going to do that." Wait a minute. Back up the truck. "We've never suggested we weren't going to" honor the contracts? As I said the other day, these words do more than strain credulity. Exhibit A: The "Cut or Keep" survey pushed out to parents, teachers, and staff, which included salaries in the list of things to cut or keep. If salaries and/or benefits were renegotiated it would impact all employees. Neither of these things depends on a he said/she said sort of verification. Both are documented in writing. Did the school system suggest they weren't going to honor the contracts? Absolutely. So, looks like if you just say "optimistically" in front of ANYTHING, it can be completely untrue. I "optimistically" want to win the Mega Millons or Powerball this weekend but the likelihood of that being TRUE is slim to none. Why is all of this important? Well, there are a variety of reasons: honoring negotiated agreements, how one treats employees, how one communicates to the public through the press, to name a few. But the single most important reason to consider tonight, as the County Council considers testimony on the school budget, is this: when the head of the school system submits a budget to the County, you want to believe that this is a person who tells the truth. If that fact is in question, then so is everything else. This year's Wine in the Woods is next weekend, May 21-22. Come see me at the Inner Arbor Trust booth. We've got some pretty sweet surprises in store for you. children danced, young couples held hands, older couples shared a well-worn blanket and enjoyed the music. A shout-out to Michael McCall and the Inner Arbor team for coordinating volunteers to run a booth at Wine in the Woods this weekend. The response was positive, curious, sometimes even excited. I heard a woman exclaim, "I can't wait for this to happen!" Big news. The sun is out and there's a bit of blue in the sky. According to my weather app, this may last until about 2:00 pm, more or less, so get out and enjoy it. Yesterday afternoon was glorious. Here's hoping we have more of the same today. Coverage of budget hearing at hcpss, which contains a quote from the Superintendent which does more than strain credulity. The beginning of a new venture in Oakland Mills revitalization. Let's hope it's not about displacing low-income and minority residents. There's actually a lot of big news. There's a PATH IAF meeting Tuesday night on a Community Agenda for Howard County Schools, based on a year of public input. The Planning Board voted on affordable housing plans for Downtown Columbia this week. There's something wacky going on in the relationship between the Governor and Comptroller vs. everyone else, it seems. That last one is crying out for a HoCoRising post. Not obsessed by current events? Get out of the house and enjoy the weather. The news will still be waiting when it starts to rain again and you have to come back inside. HCPSS Board Chair Christine O'Connor would like you to pick up the pace, please. At the Board of Education Budget Meeting last night she can be heard whispering to Superintendent Foose, "Is this going to go on all night?" She was clearly in a hurry to get somewhere. Anywhere. She must have thought she was pretty clever when she instructed the timekeepers to begin timing public testimony from the moment the person's name was called, instead of waiting for them to actually come to the front of the room and sit down to testify. The timekeepers didn't agree, thank goodness. Ms. O'Connor may have been in a hurry but the public was not. Teachers, parents, families, and community members were there to ensure that their voices were heard in the budget process. One could see pride, exhilaration, determination, and, to be sure, frustration and indignation, but nobody was in a hurry to wrap up and be done with it. It was a moment to be savored. They came to have their say. They came to support teachers and families who could not be there. They came to denounce a budget devised with no community oversight and a budget "survey" which was nothing but a sham. They came to let it be known that the community will not be ignored or silenced. In a hurry? Not them. It was always my intention to attend this meeting tonight, but it certainly hadn’t been my intention to testify until 2 days ago. Call it the straw that broke the camel’s back. I heard about all the principals being summoned to Central Office and then about the talking points these poor principals should employ to scare their teaching teams into surrendering on the battlefield and filling out the asinine budget cuts survey. I know many of our teachers are frightened and intimidated by these tactics, fearful of speaking out. This is America, last time I checked it’s still a democracy and no one should ever feel that way about raising their voice in dissent. I am here for all the teachers, each and every single one who have impacted the lives of my fourth grade daughter Hunniya and my eighth grade son Musa. $50 million in cuts. $50 million in cuts. Somewhere in all of this you’re all losing sight of the fact that you’re getting $30 million more than last year. These threats of furloughs, bigger class sizes, cutbacks in the things that directly impact classroom instruction, this is all nonsense. You can’t pull the wool over our eyes any more. County Executive Kittleman specifically said that he has fully funded the classroom instruction and special education parts of the budget. We have already spoken in April. It seems you have taken little notice. Enough. Really. Just enough. Your survey isn’t going to give you the mandate to make the selected cuts you want. Let our teachers teach and stop using them for your own political ends. You know, we spend so many hours in our schools teaching our children how important it is to be an upstander and not a bystander in the face of bullying. That’s what we’re all telling you tonight. We the parents are here being upstanders for our teachers. We will not stand by and watch them suffer at the hands of your bullying tactics. I know you’re not really listening to me tonight but the days of us dealing with this rubbish and your consistent disrespect of the fine teaching professionals in this county are numbered. We sent you a message in the primaries and you’ll see it again in November. This is clear, forthright, and damning. Ms. Jafri is telling it like it is. She will not stand by while teachers are mistreated, schools are in decline and students are sacrificed. By the looks of the massive turnout last night, combined with those following along in real time at home, she is not alone. This is what I think: If you are an elected public servant and your overriding goal is to get away from public testimony as quickly as possible--well, maybe public service just isn't for you. Howard County wants a school board that exemplifies the best in public service. If we're in a hurry to get anywhere, it's to November. On Tuesday evening I participated in a three-person panel on the topic of blogs, bloggers, and how blogs can impact the local political scene and elections. Hosted by the Ellicott City and Western Howard County Democratic Club, the event, entitled "Meet the Bloggers", was held at Kelsey's in the Normandy Shopping Center. Though you might suspect that events held in a private room at a place called Kelsey's were the stuff of wheeling, dealing, and secret handshakes, Tuesday evening was nothing of the sort. The folks from ECWHCDC are a friendly and humorous bunch. The meeting began with the usual sort of club business, discussion of upcoming events, allocation of ad purchases in event programs, and so forth. Dan Medinger presided over the proceedings with an easy, light-hearted touch. On the panel: Scott Ewart, of Scott E's Blog, Jonathan Shurberg of Maryland Scramble, and me. We each had an opportunity to introduce ourselves, talk about the origins of our blogs, what we write about, and what our goals are. Then the meeting was opened up to questions. They ranged from curiousity about things like numbers of hits, to promotion and advertising, to dealing with rude comments. Several people just wanted to know how you find blogs to read in the first place. (Someone did a quick explanation of HoCoBlogs at this point.) Those in attendance covered a wide range of experience when it came to the blogging scene, and the questions reflected that. I would just like to go on the record in asserting that I did smile and even laugh during this event. I have yet to see any photos that reflect this. Sigh. As Dan Medinger said in his introduction, you always learn something at events like this. While I knew Scott and was familiar with his work, I didn't know Mr. Shurberg and enjoyed learning about his journey into blogging and his goals for his blog. I also enjoyed meeting the members of the ECWHCDC and hearing from them throughout the evening. They are a curious, caring, and committed bunch. I'd like to thank Mr. Medinger for inviting me, and Howard County Democratic Central Committee Chair Abby Hendrix for suggesting my name as a possible panelist. I had a great time talking about something I love. 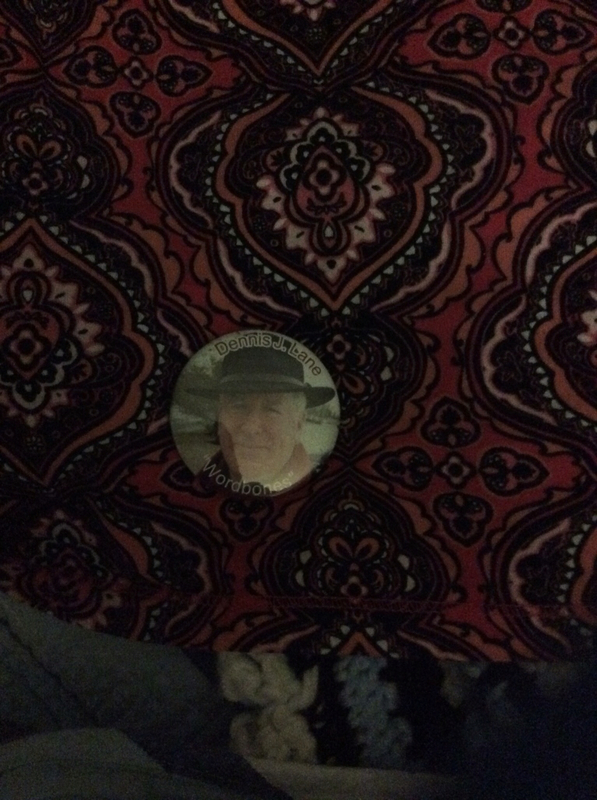 Here's a close up of the shirt that I wore Tuesday evening. I wouldn't have even been in the room if it hadn't been for this man, Dennis Lane. His influence on my writing and how I see my blog has been immense. Tonight: Board of Education Meeting addressing Budget issues at Central Office on Route 108, 7:30 pm. Who knows how early one would need to come to get an actual seat, so bring a blanket, bring a camp chair, bring your family, and turn out to support teachers, children, and families in our school system. P.S. Don't take "the survey". "All principals were called to the Board of Education this morning and sent back to schools to have stand up meetings to scare us into thinking that the budget crisis is dire and that we should all take the survey. The message was that things will be really bad if we don't get more money - larger class sizes, reduced staffing, etc." Since when is forcing people to take a "survey" required as a condition of employment? Clarksville and Fulton ES school staff will have their standup meetings tomorrow. I asked staff member what a stand up meeting meant. Answer: "A quick meeting. Usually it's some type of emergency info that needs to be disseminated - a death, something happening in the community, or I guess when your superintendent wants to use you for political purposes." Staff were told the the surplus hiring process has been frozen. Let's let that sink in for a minute. The County Executive has fully funded teachers' salaries and instruction and this is no secret. And yet Central Office appears to be holding employees hostage in a budget crisis that was manufactured at the top. Principals are being given talking points to frighten and coerce teachers into believing that their jobs are at stake. To be clear: jobs are at stake here. But they are much, much higher up. If there is some difficulty reconfiguring the school system budget then I am hopeful that the County Council and the County Executive can give some pointers, informed by your recommendations, that is. You have written them, right? It is not worth the energy protesting this survey and this new scare tactic. The survey is as ridiculous after these stand up meetings as it was yesterday. Don't sweat it. What you can spend energy on is finding a red(for teachers) or blue (for parents/families) shirt and coming out Thursday, May 12 at 7:30pm. That is how we answer. Bring the kids, bring a lawn chair, bring a blanket, whatever. I'm actually going to volunteer to help with organizing the crowd outside. I might even buy some beach balls. We really need to concentrate our efforts on that evening and let Dr. Foose know we have the power. It's our school system, it's our community, they're our children, it's our money, and these underhanded scare tactics won't fly in our county. Update. I am horrible at Twitter. The hcpss communications director claims he did not block me....He didn't answer me but did answer another parent. I cannot know for sure and want to err on the side of fairness and take him at his word. I'm sorry if I made a mistake, especially to those who have lightened my load by listening and being openly supportive. Mrs. McComas is a truly gracious human being. not that I'm aware of and I don't believe she is blocked currently. I find this denial to be a bit like those "to the best of my recollection" statements from Watergate days. But that's just an opinion. I wanted to set you straight on the facts as I know them, because I take responsibility for my work. in coordination with community recommendations from appropriate stakeholders. Funny thing. That language was included when the policy went to the Superintendent for review, and when it came back that language had been removed. In its place? The Superintendent has full authority to develop technology guidelines. And there you have it. Coordination and stakeholders have been neatly excised. Are we surprised? If you think that parents should have a voice in developing future technology guidelines, please write the Board of Education before Thursday evening or sign up to speak at the Board Meeting. As I mentioned in passing yesterday, I'll be a part of a panel discussion sith Scott Ewart and Jonathan Shurberg this evening about blogs, bloggers, and their relationship to the local polital scene. Details are here. I've been encouraged to invite readers/fans, so consider yourself invited. The panel part of the evening should begin around 7:45. Whatever it is that you do today, spend some time with the people that you love and make sure they know that you love them. Our next concert is this Sunday at 5:00,and will feature not only the concert band, but the debut performance of the new Columbia Big Band! Come out and hear the amazing music we've prepared! A Gala Concert showcasing our Adult and Children's Choirs, Jazz/Pop Vocal Ensemble, Jazz Sextet and Soloists. Celebrating UUCC's glorious new building and our Music Ministry's 25th anniversary! What, besides music, do these two events have in common? They should both totally be publicized on Totally HoCo, Howard County's newest (and dare I say, coolest) calendar of HoCo Happenings. Created by Jessie Newburn, who founded HoCoBlogs with Robin Abello, Totally HoCo is a free and easy to use way to publicize local events. They also accept sponsorships from local businesses to support the venture. There's a lovely piece about Jessie in this month's Howard Magazine. "It started with an idea to transform the way a community connects," begins the article. Since making connections is the whole point of my blog, I'm a big fan of ways that help people do that. 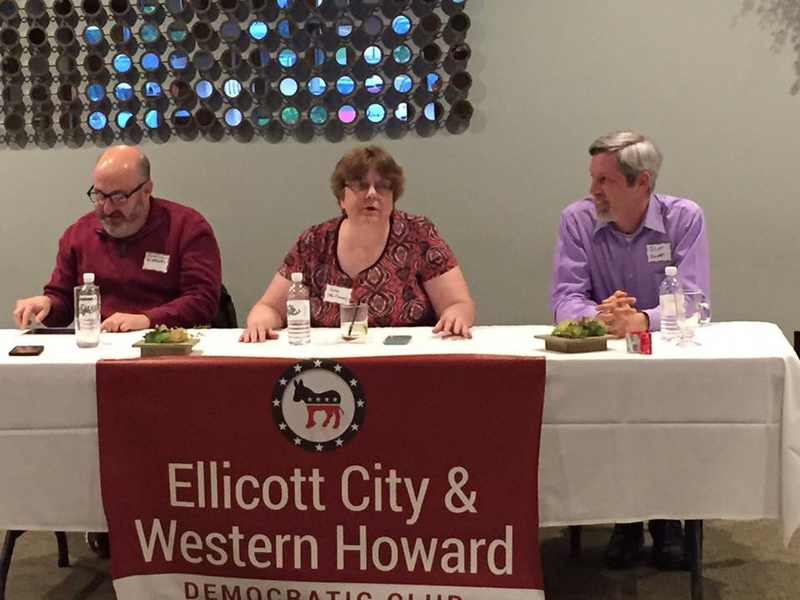 Speaking of blogs, there's a rumor that some local bloggers may be making an appearance as panelists at this month's meeting of the Western Howard County and Ellicott City Democratic Club. I'd tell you more, but they don't appear to have registered the event at Totally HoCo. If you're a member, perhaps you can fill us in with the details. I think the topic has something to do with the role blogs can play in local elections. Update: I found more info on tomorrow night's event on Scott Ewart's blog.